When I arrived in Guatemala, I was in the city. Red city buses plied the streets bringing people into the capitol for work. 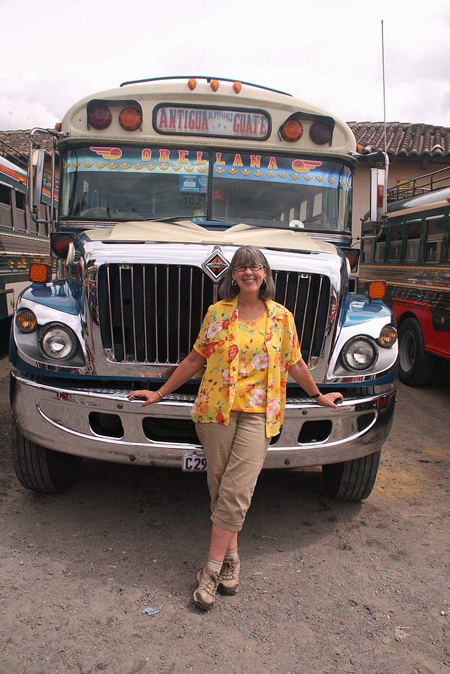 It wasn’t until we headed out to the villages in the countryside that I learned about the infamous “chicken buses.” It wasn’t until I saw outlandishly painted chicken buses careening down roads filled with passengers that I became intrigued, and ultimately, a chicken bus fan . Well, chicken bus in English slang for the colorful folk art on wheels that begins as a Blue Bird School Bus, an American icon. 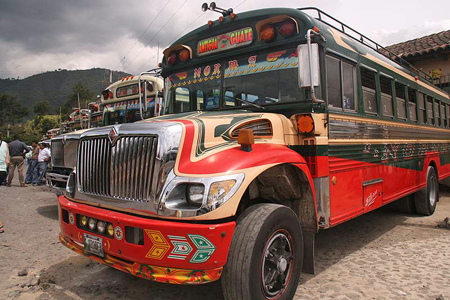 Once purchased and brought to Guatemala for resale, these familiar yellow buses are re-painted and fixed up with chrome, colorful paint and, often, religious themed decor. 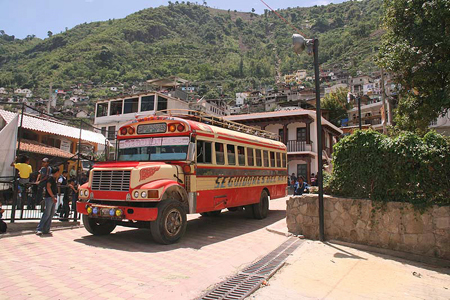 The buses travel from town to town and into the cities bringing rural residents to and from market and to visit nearby towns. 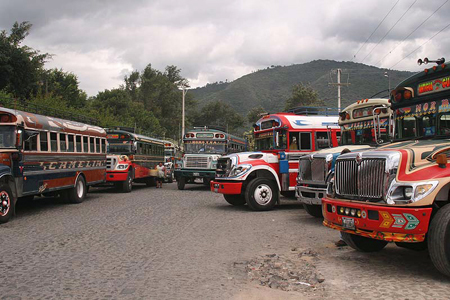 They are actually called camionetas. The bus is called a chicken bus because quite often you’ll see farm animals, as well as crops and handicrafts, being transported on top of the bus, or sometimes, riding in the bus. The buses have a designated route and you’ll see this route painted on the front of the bus along with a name, often a girl’s name. Who’s the guy on top of the bus? 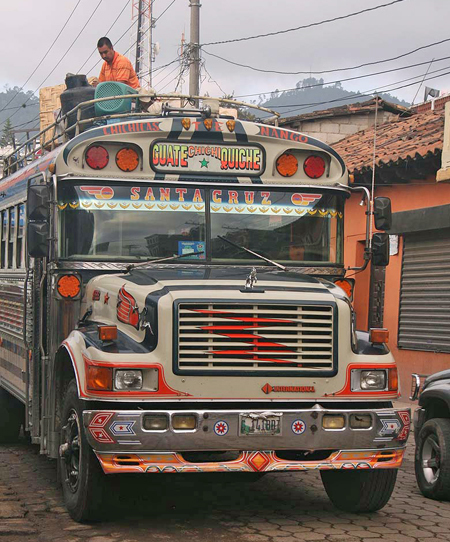 As you see these colorful buses careening down hilly roads and racing through small towns you’ll notice a young man hanging on the outside of the bus, or perhaps up top re-arranging the load. This guy is the ayudante, a partner of the chicken bus driver. This dare-devil will step out in front of traffic to stop cars so his chicken bus can pass through an intersection. He’ll lift heavy loads on top of the bus and secure them. And, he’ll often be seen hanging on for dear life as the chicken bus passes cars on roads that looked to me to be one-way mountain roads. These are roads which have no guard rails. Yikes! Can you ride a chicken bus? We’ll I suppose the most adventurous and fool-hardy tourist would try. I, myself, prefer to photograph them. If you search on the Internet for chicken bus advice, you’ll find that visitors do try to ride them. 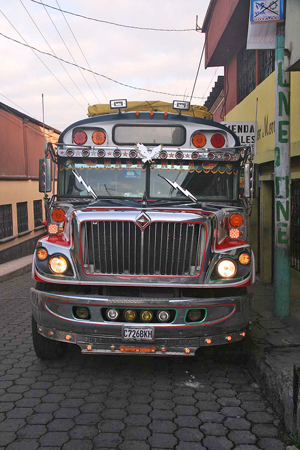 To find a chicken bus, don’t ask for a “camion pollo,” or “bus chicken,” as the locals call them camionetas. In town you’ll find buses at the depot. In rural areas, you may have to ask where and when to catch a bus. 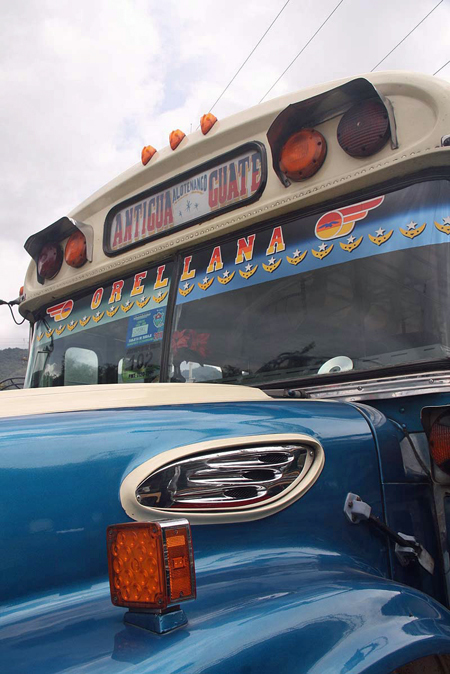 Once you approach the bus, the ayudante will be the one to secure your backpack or luggage up top. Try your best to find a seat. I hear it isn’t easy, and eventually the ayudante will come by to collect fare. One writer suggested that you watch others to see how much they pay as you, as a visitor, might get charged more than Maria and her prize chicken. Since chicken bus drivers make more money with more passengers and more daily trips, they don’t travel slowly. 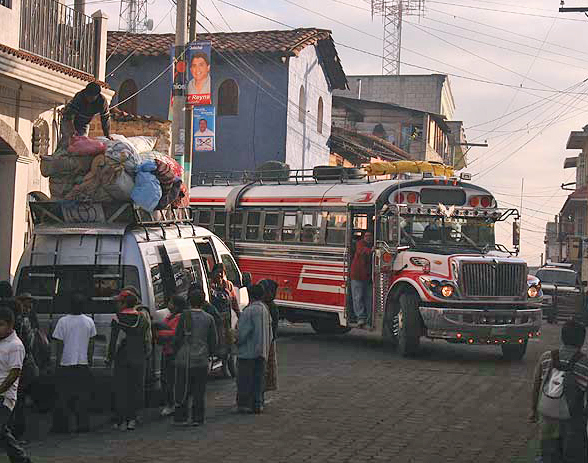 They travel as fast as possible, down mountain roads, through villages and along cobblestone streets. This type of driving is not for the faint of heart. I’d equate it to one of the most innovative thrill rides at your local theme park. You know, the type you have to have a signed release from your doctor to ride. 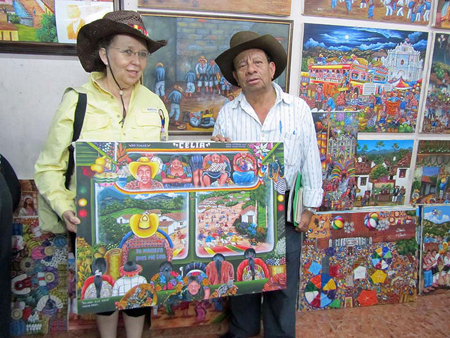 While touring Guatemala we had the pleasure of stopping by the home of folk artist, Oscar Peren, of San Juan Comalpa. Oscar Peren is known internationally for his folk art paintings, the most collectible of which are his humorous depictions of chicken buses. Often he paints images of himself and family members riding on the bus. 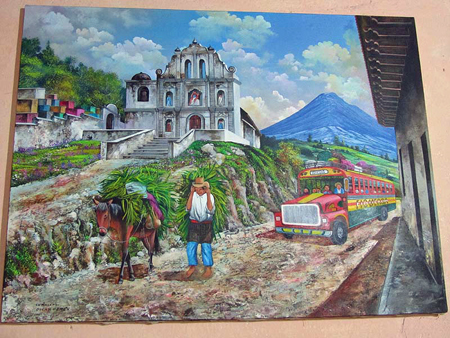 His paintings can be purchased from his home gallery in Comalpa. 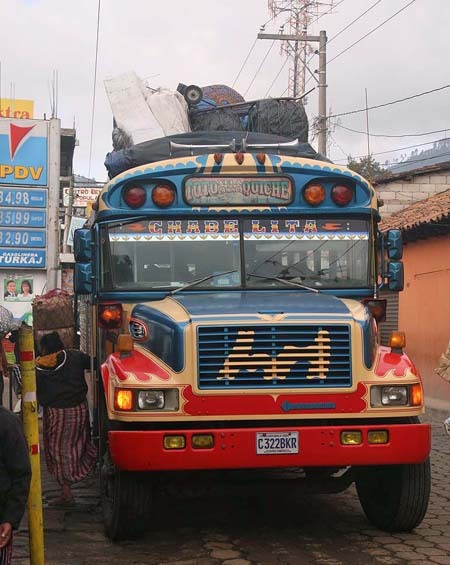 I enjoy folk art and found the chicken bus to be a great example of Central American folk art. 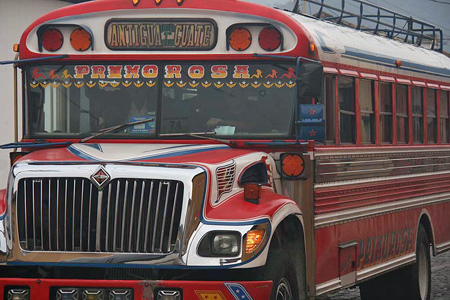 You’ll find these buses in other Central American countries and, if you are like me, will develop a hobby of photographing the most colorful ones.